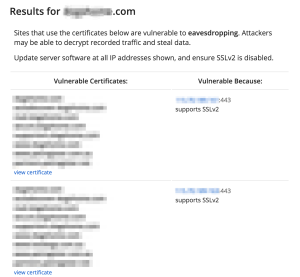 The “DROWN Attack” is the name given to a recent vulnerability impacting on some servers running SSLv2. This page contains information on how to test for the DROWN vulnerability, with a list of further reading. The word DROWN comes from “Decrypting RSA with Obsolete and Weakened eNcryption”. You can see the full list of the top affected sites here. WordPress Security was the topic of focus at the local Melbourne WordPress User Meetup. Amelia Briscoe covered .htaccess and Tristan Penman covered an Introduction to SSL (I’ll add their slides here when they’re published). If you’re just after the resources, below is a quick summary. Not only is Google Search Console useful for SEO, it’s a complete health dashboard for your websites. In addition to outages, spam and crawling errors, if Google detects your site has been compromised you’ll get an alert – so it’s another reason why you should be using it. Each year, Verizon releases a report called the Data Breach Investigation Report that can be a real eye opener and help build a business case for resources and for improving general security awareness. An executive summary is also available. The official WordPress documentation servers as a great starting point if you want to learn more about basic security, as well as how it applies specifically to WordPress. There is no such thing as absolute security, so make sure you have regular backups and apply updates early and often. But what if a site you’re responsible for has been hacked? Even after you clean up the damage it’s always a good idea to check to make sure that your site hasn’t been blacklisted. If your IP address or domain has been blacklisted it could affect your ability to send email and/or appear on the search engine results pages. A quick search will yield dozens of tools that can help you with this. This article should at least help get you get started. Since a compromised server could have been used to send spam email, distribute malware or host/post webspam it’s worth checking the DNS-based (DNSBL) blacklist providers, as well as search engines. To check if your mail server has been blacklisted, MXToolbox has a great feature along with many other useful tools for mail troubleshooting. Sites can get blacklisted for a variety of reasons, so if it happens to you all is not lost.